Striking doctors protest at Parirenyatwa (file photo). 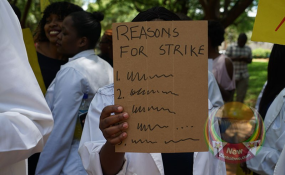 Senior doctors at Zimbabwe's foremost health facility Parirenyatwa Hospital have downed their tools in protests against shortage of essential drugs and equipment. In a letter to Health Minister Obadiah Moyo and copied to permanent secretary Gerald Gwinji as well as other senior officials, consultants at the hospital said they had, had enough. "As the consultants of Parirenyatwa Group of Hospitals, we have decided to rationalise use of the limited and very finite resources that are currently available. "We are now forced with immediate effect to further scale down the services which we are offering, to deal with dire emergencies only until the situation normalizes," said the doctors. Government, the consultants said in the letter had failed to resolve the issues that had forced junior doctors to embark on industrial action in December last year despite the senior practitioners having stepped in to fill the void at the time and allow government time to find a solution. "As consultants who were and are concerned with return to normalcy, we stepped in and persuaded the junior doctors to return to work in good faith that our parent ministry would improve the supply of the basic consumables," said the doctors. The situation according to the senior doctors with regards to medical consumables and equipment is now even worse than it was in December 2018. "This has continued to cause severe compromise in the safety and working conditions of staff and a reduced capacity to deliver services to patients," they said. The letter added: "We feel that these compounding factors have compromised patient care, putting patients' health and lives at risk at the very institution which is supposed to restore health and life." The doctors are also arguing that since the beginning of the year they have been unable to resume normal service, especially in the areas of anesthesia, surgery and critical care due to the constraints. "We have tried to make adjustments to no avail. Currently most surgical firms are only operating on elective patients twice a month," said the letter. "Statistics show that for January and February this year, we have operated less than 20% of the elective cases that we were doing in same period in 2018. "For emergencies, the time taken before the patient goes to theater is now unnecessarily to long as their relatives have to privately source for the necessary supplies," the consultants argued. "Furthermore, patients with simple conditions like appendicitis and diabetic foot ulcers are going for days without the required antibiotics leading to unnecessary complications. This is just one simple example of the dire conditions patients are currently facing." Nurses and junior doctors went on strike on separate occasions last year demanding better working conditions. Government through Vice President Constantino Chiwenga reacted by initially firing all those who had participated before the decision was reversed by President Emmerson Mnangagwa. Zimbabwe's health services have hit rock bottom after years of neglect with patients dying due to shortage of basic drugs and ancillaries that allow health workers to deliver services.